Automated airport and airline baggage systems to connect bag with passenger’s specific flight itinerary. GPS Mobile technology to track the luggage along its journey. 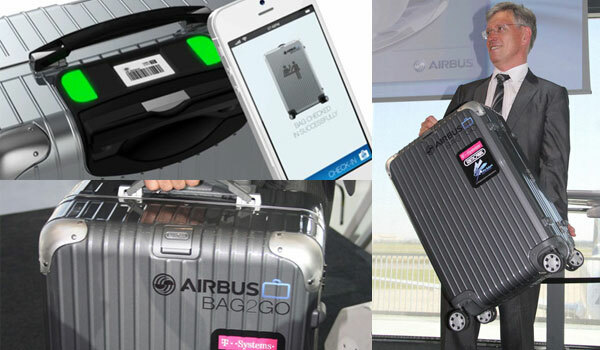 Airbus has unveiled a prototype ‘smart’ bag featuring an RFID chip, allowing passengers to track luggage during their journey. The chip allows ‘Bag2Go’ to be recognized by automated airport and airline baggage systems that connect the bag with a passenger’s specific flight itinerary. Mobile technology and other location-based technologies such as GPS, can track the luggage along its journey. The bag’s accompanying iPhone app’s ‘Find My Bag’ feature allows passengers to check whether their bag has made it onto their flight and trace its location. Yann Barbaux, Airbus’ Chief Innovation Officer, predicted that an optional door-to-door courier service would collect the Bag2Go from a passenger’s home, before delivering it to and checking it in at the airport. “You rent the bag, it comes to you, you pack it and then the bag goes to the airport,” Barbaux said. “There are companies which already do this for maybe €25. We think with this system this could be done for €8 and it would still be profitable,” he added.